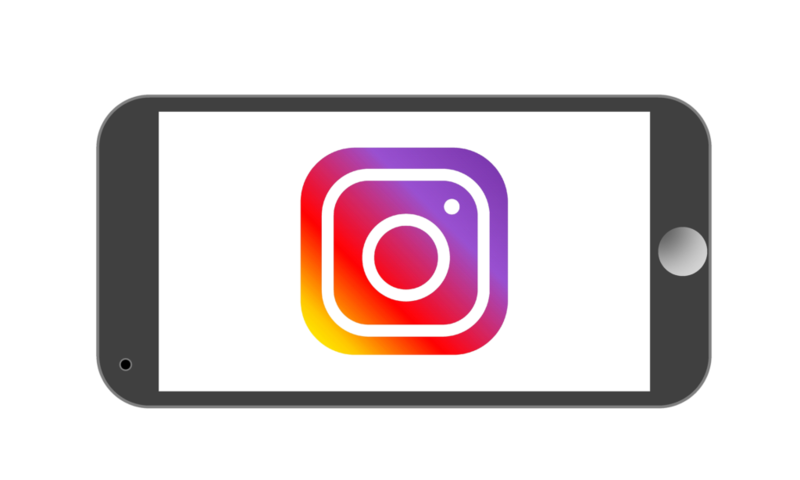 How to determine if Instagram growth is organic or automated? About three billion users worldwide have at least one account in any social network and the social media users number is growing every day. Let’s consider Instagram as an example: it’s already used by about 700 million of users among them there are famous brands and bloggers, movie stars, popular singers and models and, of course, individual users. The most common reason to build a presence on Instagram is to gain more popularity and influence on Internet. This way there is a great chance to have an opportunity to make money by promoting multiple products and services, attracting more audience to your account, collaborating with influencers and more. But to succeed on Instagram, you should have a huge number of followers and multiply it every day. The Internet is full of different tips and tricks on how to grow your account and your Instagram community – just use Google search with the query “grow my Instagram account”. It will provide you a plenty of blogs with the advice how you should behave on Instagram. But actually all the methods of growing an account can be associated with organic and automated ways of social media growth. First let’s discover what an organic growth means. Organic is closely related to natural so it’s the way how users usually act on Instagram: they post photos and videos, create an unified theme for their posts, use popular and niche hashtags, organize contests and surely they engage. As Instagram is a social network the communication takes a great part of it: likes, comments, follows are extremely important to attract other users to like and follow you back. Acting this way you enlarge your number of followers organically so only your activity on Instagram matters in this case. But there is an alternative way that takes the minimum efforts from your side. It’s an Instagram automation or the use of Instagram bots. They will engage other users instead of you: your task is just to target the specific hashtags, geotags or users (otherwise this method won’t bring you your target audience but just random users) and the bots will like posts, comment them and follow/unfollow users on behalf of your account. This method helps you to save much time and effort and obtain a larger exposure so real people will follow you on Instagram. It’s up to you to choose one of these methods for your social media engagement but before you decide you should evaluate all the advantages and disadvantages of both of them. And be aware that many social media experts find the bot-driven growth a grey scheme. It’s always interesting how popular Instagram accounts got so many followers and continue to get them. When you look for the way to figure it out the most ordinary one springs to mind: to follow an user on Instagram and use your following feed to see how many likes, comments and follows he usually makes. It’s a prominent method that actually requires a lot of concentration and whatever doesn’t work all the time: the Instagram algorithm doesn’t show you all the actions made by an user and it’s really complicated to find the specific user’s activity likes and follows among hundreds of other users actions. We would like to describe an alternative easy method: monitoring. 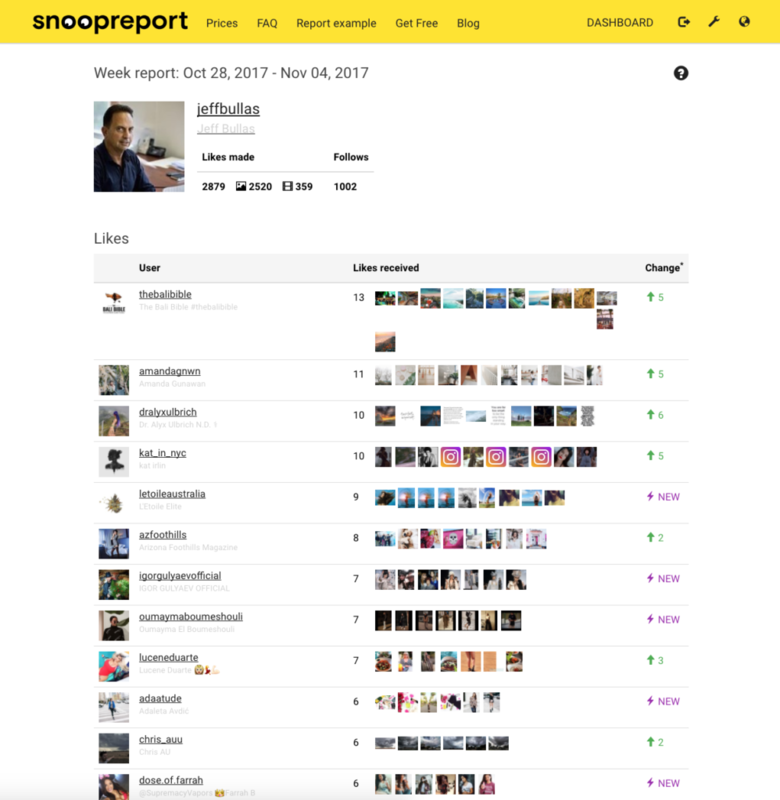 The Instagram tool Snoopreportcan help you by tracking Instagram user activity. The service will assist you in the research of your competitors marketing strategy, your customers interests, raising trends on Instagram. 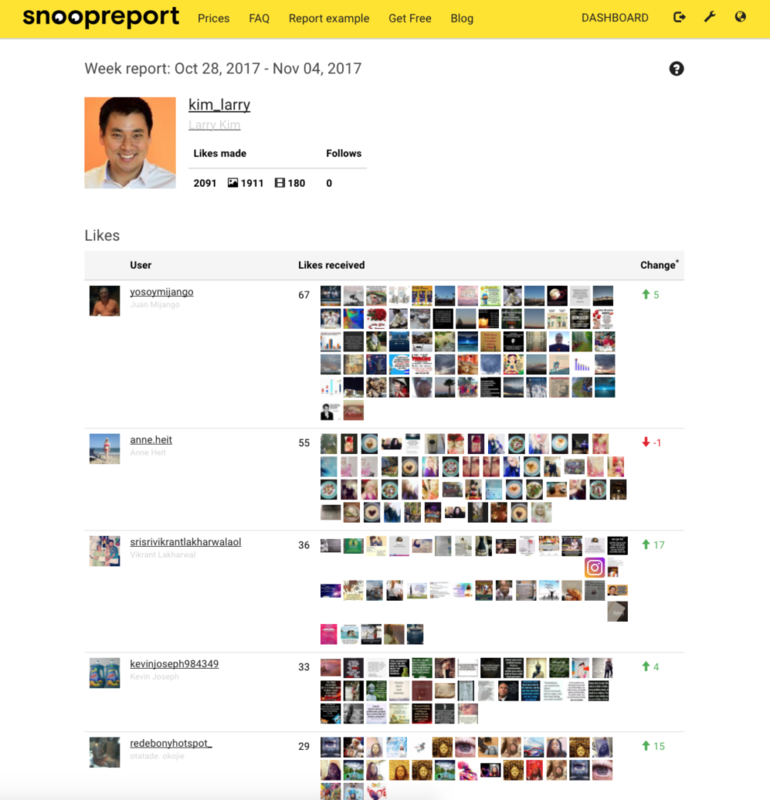 Snoopreport provides weekly and monthly reports with user activity data as likes, comments and follows that is truly effective for exploring user insights and user behavior tendencies.. 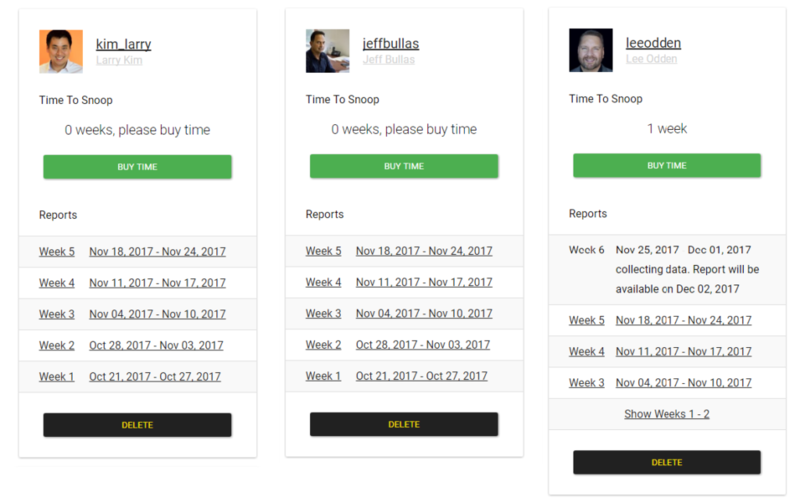 So with Snoopreport you’re able to apply the required user activity tracking: just make a list of Instagram users whose engagement strategy you want to explore and add their accounts in a dashboard by entering their usernames and buy time package to start the monitoring. 2-3 weeks can be enough to understand how an user engages on Instagram. Every week the service will provide the results of monitoring so you can see every photo someone likes on Instagram and users he followed. With this information you will ascertain a growth strategy of an Instagram account you’re interested in. Just take the stats of the monitoring and compare them with the common user behavior. It is supposed for the standard activity to make from 50 to 500 likes and 20-30 follows a week. You can analyze the follows made by an user the same way – if the user followed more than 20 users within a week, it isn’t an organic way for sure, be in the know of automate follow-to-follow method. Now you’re informed how to determine a user account growth strategy on Instagram easily, don’t hesitate to use it for your own investigation! Snoopreport is the service that tracks Instagram user actions such as likes, comments and follows. It suits not only for the use by marketers who need to learn the competitors, target audience and influencers activity but also for individuals: they can see friends Instagram activity, track Instagram comments of their kids, see every photo a boyfriend/girlfriend likes on Instagram.